As a simple matter of economic convenience, some of the best art collections in the world started out going against established taste. By avoiding what was already highly valued — and therefore expensive — collectors could build up impressive collections that could then help to dictate future tastes. You would expect this rule of collecting to be true for modern art, but the same also holds true for traditional Japanese art, which, despite its vintage, still continues to see trends and fashions. The Feinbergs — whose collection of traditional Japanese art is one of the best in the world — are a case in point. When they started collecting Japanese works in the early 1970s, the dominant taste were the paintings of the Muromachi Period (1338-1573), typified by ink-wash landscapes, like those of Sesshu Toyo, which owed a strong debt to China. 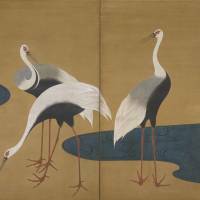 Bolstered by their rarity value, such subtle monochrome works sat at the pinnacle of foreign appreciation of Japanese art. 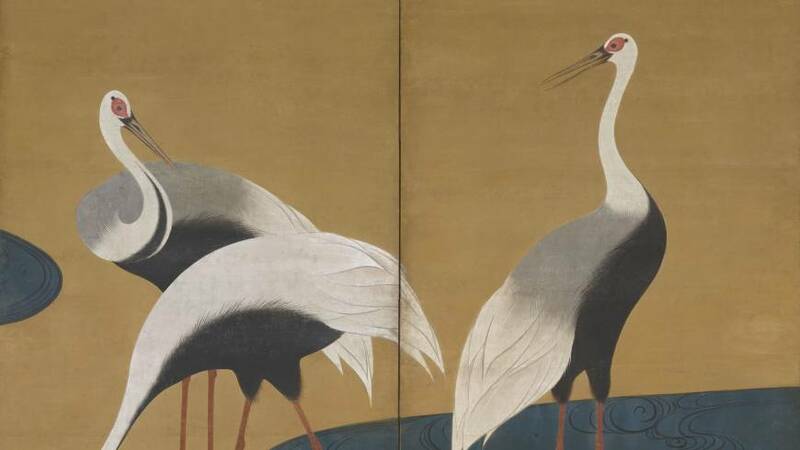 But, like all good collectors, the Feinbergs were led by their personal preferences — as well as their pocketbooks — to look elsewhere, finding what they were looking for in the less-appreciated works of the Edo Period (1603-1867). These included the art of the Rimpa school, founded by Tawaraya Sotatsu, which reached it zenith in the work of Ogata Korin (1658-1716). Rimpa was characterized by its love of color and decoration, but this is not particularly obvious in the sole work by Sotatsu, ironically enough, a monochrome ink painting of a Tiger. Nor is it apparent in the works by Korin included in the exhibition. These are a pair of delicate uchiwa-e (round fan paintings) with white chrysanthemum and snow-covered reed designs. The reeds have a beautiful frosted appearance that perfectly complements the subdued tones and faded antique look. 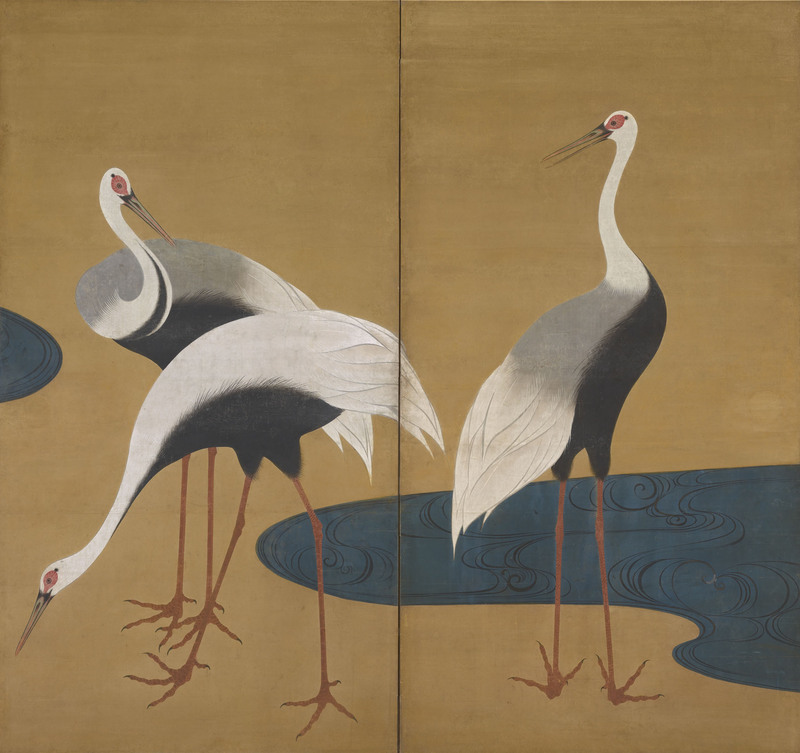 To get a better idea of the full power of Rimpa decorativeness look instead at Tawaraya Sori’s “Autumn Maple Tree” (c. 1800), a six-panel folding screen, or Suzuki Kiitsu’s “Cranes” (19th century), a pair of two-paneled folding screens that is a tribute to a similar work by Korin. One of the advantages that collecting Edo Period art turned out to have over acquiring earlier examples was that such works began to be seen as more authentically Japanese and less beholden to foreign — largely Chinese — models. This was partly because it was closer to the Japanese people. 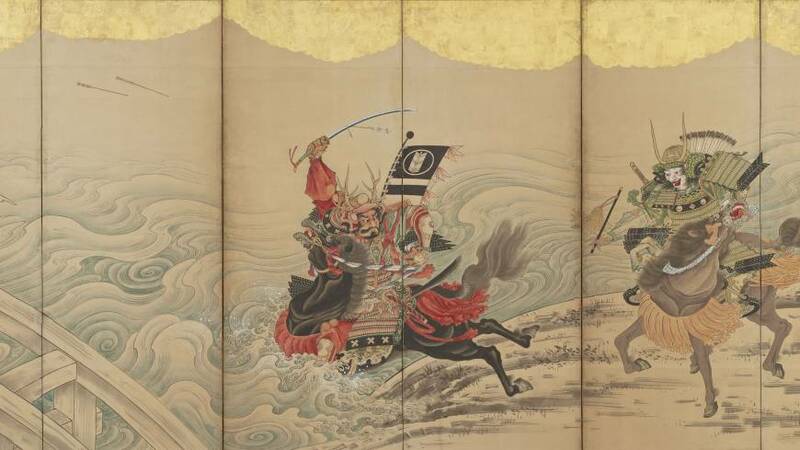 In the Muromachi Period art was still the preserve of an aristocratic clique of long standing, who respected the traditions linking it to China; but the wars that preceded the Edo Period saw the rise of a new class of nobles based more on merit than blood. This democratizing ethos carried on through the Edo Period as the prolonged peace saw the rise of a rich and sophisticated urban commercial class who could afford to buy art. With less of the poetic sensibilities of the old aristocracy, this demographic craved spectacle and sensuality, qualities reflected in Hishikawa Morohira’s “Autumn in the Yoshiwara — Cherry Blossom Celebrations” (17th century), a painting across two six-paneled folding screens that shows life in all its ugliness, beauty, vulgarity and joy, as drunks dance under cherry blossoms and prostitutes wait in their cage to be selected. While a fascinating historical document, the over-ambitiousness of the piece, which tries to include too much, weakens its overall aesthetic effect. Much more satisfying as artworks are Kaigetsudo Doshin’s powerfully stylized studies of individual courtesans from the 18th century. While the colors and kimono patterns attract, it is the melodious lines that really delight. The fact that the cursory faces could have been made out of pieces of dough with a few incisions hardly seems to matter! Also of interest, in a show which gives a writer too many options to write about, are the paintings that hint at the approach of Western influence, such as Utagawa Toyoharu’s “Pastimes of a Spring Afternoon” (18th century), an optical view that employs Western tricks of perspective. 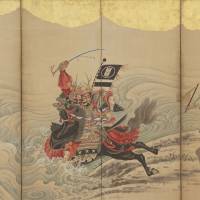 Such a work reminds us that the political change that overtook Japan in the Meiji revolution was prefigured in the earlier democratization of its art. This is just one narrative to discover in this fascinating collection.